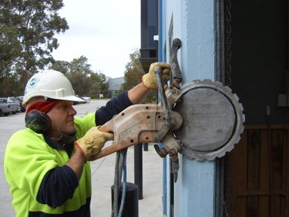 Concrete cutting can take care of sawing, drilling and removing pieces of concrete in a controlled manner, using saws that have diamond impregnated blades. It is important to note that concrete cutting is done by skilled workers with plenty of experience and that know exactly what they are doing. In the past people used a jack hammer to get rid of this concrete, but this method left much to be desired. Concrete cutting leaves a smooth cut and finish and also uses water to prevent dust and mess. Concrete cutting knows several different specialties, such as core drilling, wall sawing and flat sawing. A well-known technique in concrete cutting is wall sawing. This process cuts through openings such as windows and doors in walls of concrete. Most of these walls are no more than 30 Cm thick, yet there are cases in which the thickness can count up to 30 Cm thick. Concrete wall cutting is usually done using a saw attached to a wall track. The saw itself is usually very large, with a size of 70 Cm and made with a diamond blade. Wall cutting requires knowledge, experience and skill and cannot be performed by just anyone. This makes it clear that a lot of experience and talent is needed to get the job done perfectly. The service itself is therefore, understandably, more expensive than other services of its kind. Some property owners find that it is easier, safer and even cheaper in some cases, to hire a concrete cutting contractor to perform wall cutting to cut into an existing foundation, as they are trying to build an additional basement. Doing this during construction is more beneficial than doing it after. Another specialty of concrete cutting companies is core drilling. This is another complicated process where holes are being drilled through walls and floors of concrete, which are perfectly round and usually have a diameter of 2 Cm to 30 Cm. Core drilling for commercial buildings can lead up to holes of double that size. These holes are being used for electrical or plumbing, but also for heating and furnaces. Core drilling is less complex than wall cutting, but still needs experience and knowledge. It is therefore advisable to hire an experienced concrete cutting contractor. This might save you money and time, by not having to correct any mistakes made by someone that is inexperienced. On top of that, core drilling is a lot less expensive than wall cutting and is usually done in just a few minutes by the right company. If you want to do it yourself, then you might spend an entire week trying to use the machinery and to drill the holes. A professional concrete cutter will make it look much easier. Flat sawing is also a heavily used technique in concrete cutting. This technique is used to a flat surface, like a floor or pavement. The machine that is used to cut uses blades of diamond and has a machine with an operator walking behind. For private properties, the average cutting depth is 15 Cm, but it is possible for this machinery to cut to a depth of around 80 Cm. But what is this technique used for? Flat sawing is the ideal problem solver for pipes that are broken, as it is easy to reach the pipes with a nice and clear cut. It is also perfect to repair a sewer line or to add plumbing of a new bathroom in the basement for example. Demolition work can also be done with a flat saw, as it can break pieces easily and remove a driveway, patio and much more. Flat sawing is the easiest of the three and can possibly be done by someone more inexperienced. However, it also requires a lot of time to do and you are much better off hiring a professional. If you have any kind of concrete cutting tasks, it is better to hire a professional to take care of it for you. You might end up saving time and money in the end. Faulty construction can end up as a serious problem, causing you to lose even more money while trying to fix the problems. At Megasaw you can expect the best service with a friendly and kind touch. We are professionals with more than 20 years of experience. If you have a project in Melbourne, don’t hesitate to get in touch with us. We can help you with concrete cutting, concrete drilling and much more. With us, you can get your project done faster than you though possible. Call us for more information!